← Taggers of Mural Of Jim Morphesis Monument Put On Notice! I’ve been received very warmly and hospitably. Its been really wonderful to get to know everyone. 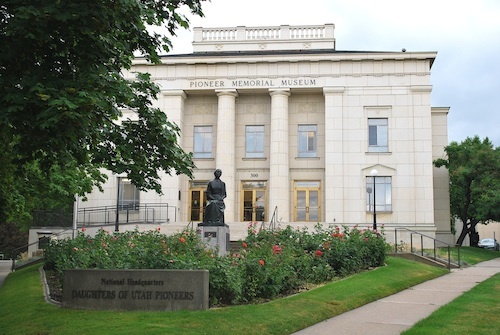 I started doing work for this really fantastic museum back in 1980 but when I moved out of Utah in 1984 and the administration of the museum turned over, I lost contact. This is my first project, working again with this organization of which I am so enthusiastic. The museum has an extraordinary collection of early Americana and Pioneer art and artifacts. 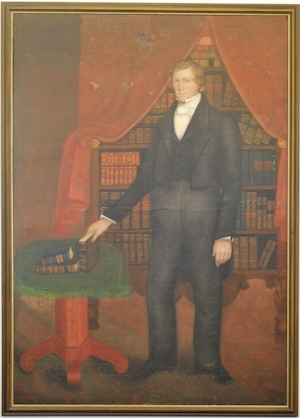 Today, I’ll be doing art conservation treatments on the hugely important and historical full sized portrait of Brigham Young, painted about 1843 in Nauvoo, Illinois a couple of years prior to the Mormon exodus West. Actually, this is the second time I’ve worked on this portrait. Back in about 1980 I did the major art conservation work on it. But a few years ago during a renovation, there was a mishap with the contractors and smoke and dust spewed out in the room with this painting and its covered with a layer of black dust and grime. So, today, I will be cleaning a painting and revarnishing. It looks like the work at the museum will be a long term relationship. I’ll be setting up a blog with great articles and videos so you can stay in touch with the wonderful historical paintings that we will be doing art conservation and restoration on and other very interesting news from this very cool organization. Its a delightful and fun time capsule into the past walking through their exhibitions. Be sure to sign up for updates to this blog in the upper right corner of this page! This entry was posted in Travel and tagged Brigham Young, cleaning a painting, Daughters of Utah Pioneers, Mormon art, Mormon pioneers, Salt Lake City. Bookmark the permalink. I would like to find out more about the painter Selah Van Sickle that Rita Wright mentioned in her note to Mr Haskins. Thank you a lot for sharing this with all of us who missed the meeting. I’ve heard you may be speaking at our meeting in Layton, UT later this Oct. I hope so!!! While I am not a Mormon and have no plans to become one, I can certainly appreciate how precious these paintings are. I love history and the actual physical evidence passed down over generations. The fact that there was no photography in those days, and that paintings were the only way to preserve someones likeness is equally fascinating. How great it must feel to work with old church paintings. Nice work! The DUP is a wonderful organization that haas helped me to connect with my pioneer past. Everyone’s been really nice. Thanks for your efforts to help preserve the artwork and paintings. I can’t imagine a more satisfying work with good results that effects people long into the future. Terrific work! I imagine that the projects you work on are very satisfying. Historic paintings where some of the story is known are like a time travel capsule for me. I love looking through this wonderful museum. It was organized solely for historical, educational, and public purposes and is completely non-political and non-sectarian. Well done! This is the best and the biggest museum in the world that deals with a single subject. Thanks for the comment. I’ve been bedazzled while at the DUP. There is so much interesting stuff. I even found a photo of an ancestor, Agnes LeBaron. They are SO MUCH more organized with their collection and photos than they were even 10 years ago. I love working with this group. Thanks for the note, Rita. Its been a busy week between the SL Temple murals and the DUP so there wasn’t a lot of extra time anyway. Good luck with the competition. I look forward to seeing some great stuff in the exhibition at the Church History Museum. I am THRILLED with the work you are doing on these works of art depicting early church history! Keep the blogs and videos coming! I will be following with great interest! Thank you, FACL and Scott M. Haskins for your professionalism and commitment to excellence in all that you do!